I've been reading a lot of good books this summer and will probably post a summer booklist soon. 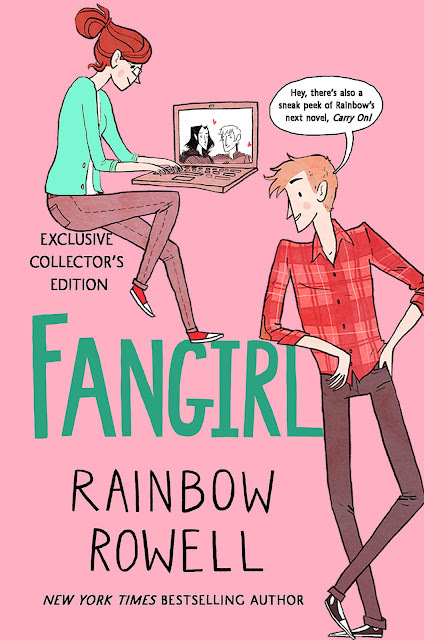 Fangirl by Rainbow Rowell is one that I recently finished and absolutely love--and not only because Rowell's descriptions of the college experience are pretty much on point. Fangirl is a coming-of-age story about twin sisters, Cath and Wren, best friends since birth and co-writers of Simon Smith (Rowell's own version of Harry Potter) fan-fiction. For Cath, Simon Snow is her entire life. Not only does her fan-fiction have over 30 thousand followers, but Simon Snow's fantasy world is her escape; writing fan-fiction is what helped her get through her parent's separation and years of living with an unstable father. When Cath and her sister go off to college, Cath must step out of her comfort zone and learn to navigate the real world without trendy, outgoing Wren to guide her. "Is Cath ready to start living on her own? And does she even want to move on if it means leaving Simon Snow behind?" Unlike most chick-lit, young adult books, I didn't fly through this one in just a few days. Although I'm not a huge fan of fan-fiction, I found myself savoring Fangirl, relating to Cath's crazy world and her ability to escape it all through writing. Rowell's novel is refreshing and realistic; I immediately fell in love with the characters: Cath's feisty and promiscuous roommate Reagan, Nick the mysterious and manipulative writing partner and Levi, the sweet boy-next-door who works at Starbucks and geeks out to all things nerdy. Every character has a unique personality and more importantly, goes through some sort of character development by the end of the book. All in all, I'd say Fangirl is a great summer read for those of you who aren't looking for anything too emotionally heavy, but still want a meaningful story and a humorous read. "Kissed. Cath loved that word. She used it sparingly in her fic, just because it felt so powerful. It felt like kissing to say it. Well done, English language."